I paint with acrylics on canvas. 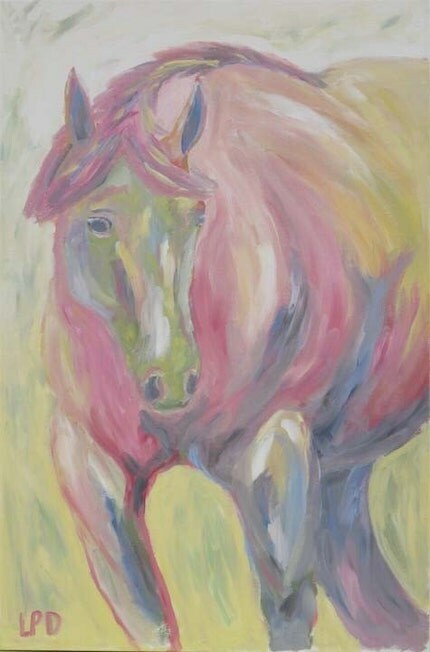 I love painting horses and to keep it interesting contrast that with abstract expressionist art. I have ridden and painted all my life and love the lines of the horse. The abstracts are a way to escape and feel free to put what I want on the canvas without following any rules. I am a juggler with two young children, dogs, cats, fish a horse and we'd like to get some chickens. I have a garden. I am an insomniac at times. I run my family's furniture business, designing and selling products we make in the Philippines. I used to travel an insane amount but when the economy slowed I put that extra time into my art career. My family is my priority. 3. Which one song describes your life the best? Why? The William Tell Overture (Lone Ranger Theme) runs through my head as I run around juggling everything that needs to be done. 3. If you had to be an animal for one week, which animal would you choose to be? And what would you do? A bird... I still have dreams of flying and think it would be so cool. 4. Tell us about your first sale ever? 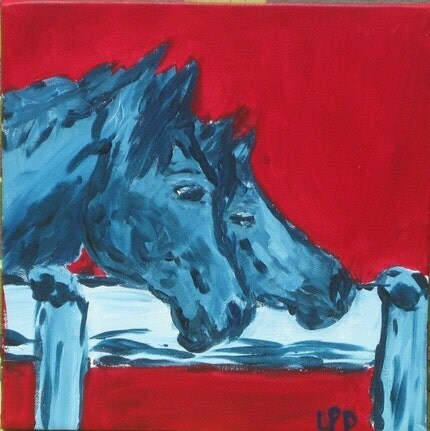 It was my first horse painting sold to a woman on the East Coast. I charged $350 for a huge painting and the shipping was $40. The shipping ended up being $180 and my supplies cost was too high. The customer was happy and I learned to compute pricing more accurately. 5. Give us some insight on how you personally, or your shop, gives back to your community. Most of my work is in the Shawna Stoney Showroom in San Francisco 390 Kansas Street @ 17th St.
Look for more details soon. And if you're an SF Etsy member, you still have time to apply for the show; applications are due by October 11th. Check out the team Google group for details about how to apply!